Good morning Taylored Expressions/Cuppie Fans!! 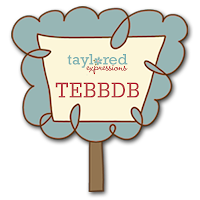 We’re so excited you’re joining us for the Taylored Expressions Birthday Bash! We’ve got so many fun challenges planned for you today and lots of SWEET prizes to celebrate Cuppie’s 1st Birthday! My challenge is the first TECHNIQUE challenge of the day; I am a HUGE fan of the of paper-piecing your line art images, it gives you a FUN, easy option in lieu of coloring. All you do is pick out your patterned papers to coordinate with the rest of your supplies for your card or project. Then, you will stamp your image on your card layer directly, then stamp your image directly on the patterned paper and cut out on the line or just inside the line for a perfect fit, because then you glue your pattern piece onto your stamped layer. CHALLENGE: Pick out your stamp set and pattern papers and follow the directions above if you've never tried this technique before. You’re not required to use Taylored Expressions images for our challenges, but if you got 'em, you may as well use 'em! Here is the card I made for this challenge - I brought out one of my favorite Cuppies from last year's Trick or Sweet set illustrated by Jessie Oleson, dracula and he is standing in front of his spooky house from Frightful Night, also a release from a year ago. What I love about these sets is they never get old - they were JUST as FUN to use this week as they were LAST YEAR! That speaks VOLUMES to me as a consumer! FUN PAPER-PIECING TIP: Since I planned on using the technique so it became a purple spider-web house compliments of the Basic Grey Eerie designer paper in the Halloween Key Ingredients! I did not have to mask the house after I stamped it so I could sponge in the spooky night sky, isn't that great? What I did do, though was make a few extra stars & a moon by using a watermark pen on the paper and embossed with clear embossing powder, the ink would 'resist' those areas and stay white. Now you see how the house fit in perfectly on the background and it looks great, huh? I also want to point out to you the attic window on the house. You will notice it is not cut out and colored in with light in the windows like the others. That is because no one was hanging out in the attic that night. That's a place strictly for storage of non-Halloween decorations, like Christmas decorations. (that's my truthful explanation for having not realized I forgot to cut out the window until AFTER I had already made & photographed my card-HA!) Now you know I'm not perfect, nor do I ever claim to be. This card was a lot of work and I put my heart into it and did not have time to make another one. I hope you still like it & would be proud to own it if you win! ANOTHER PAPER-PIECING TIP: In order to make dracula's cape look like it was really OVER his cupcake liner, I paper-pieced both with the purple designer paper. Then, I paper-pieced the cape with the polka dot paper so it was on top. It creates a more fluid and realistic effect. KEYWORD: Upload your creation to your blog or online gallery (or both). If you’re uploading to online galleries, use the keyword TEBBDB. Then come back to this challenge and leave a comment with a direct link to your creation! In order to be eligible for the prizes, you must leave a comment with a link to your card by midnight PST Wednesday, September 9th. GRAND PRIZE: One random person who participates in ALL 13 of our Birthday Bash challenges will receive a $50 gift certificate to the TE Store in addition to an 8x10 custom watercolor Cuppie painting by our very own Jessie Oleson! Click here to check out all of Jessie's adorable artwork at her Etsy Shop. Once you complete and link all 13 challenges, send an email to tayloredexpressions@gmail.com to be eligible for our grand prize! Just include your name and “I completed all 13 challenges!” HOW AWESOME IS THAT?! Donna, your card is adorable!!! I love the paper layers to create the proper depth and you are Queen of the spooky sky! Spooky sky Donna! Great challenge and a great card! Amazing card Donna! So spooky and cute! I LOVE paper piecing! Awesome challenge! Awesome card, Donna! Love the scene you created with that eerie sky! SO fun Donna! I played too! What an adorable card! Can't go wrong with paper piecing! ;) Thanks! Please be sure to click for the close up. The velvet paper of his suit doesn't photograph well. Thanks! Paper piecing is my FAVE thing...so I LOVED this challenge! Donna I just LOVE this technique and your sample is amazing!! I love your background!! love the paper piecing challenge, donna! great halloween card, too! What a great challenge, I love the layers you used too! Great job! Adorable!! Great challenge. Here is my card! Hi Donna! I just realized my card fit your challenge!! LOL! I'm such a dork!! I LOVE to paper piece, too! Well Donna I made the 13 total challenges! Thanks for the encouragement! okay can I just say.. I feel so dumb I never even thought of doing this before.. How smart are you.. So this would be perfect for those times you dont have a copic color that you need and you have paper. I am so glad I did this you have just opened a new world to me.